We can service the small studio to the extremely high paced / high volume clubs. The ease of use reduces staff labor and staff error. We make sure all fees and contracts and waivers are collected. HappyClub! is easy to use with it's No-Touch Member Billing. 24X7 door access with multi-site member check-in. Even Tanning bed support. We feature a mistake avoidance flow that automatically rings up required sign up or administrative fees along with fool proof paperless digital document and waiver capture.Perfect for tablet use and the Member Portal is extremely user friendly. 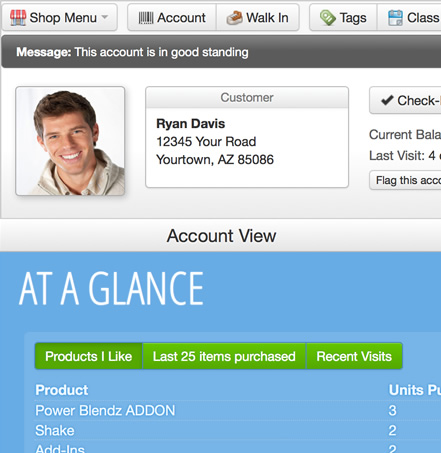 Company Dashboard shows important club information at a glance. Sales, check-in, all interactive.